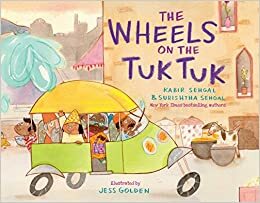 Summary: The familiar “Wheels on the Bus” gets an Indian spin as a somewhat wild and crazy tuk tuk driver (wala) weaves his way through a busy Indian town, transporting all kinds of people in his three-wheeled vehicle. Readers (and singers) are introduced to Indian rupees, poppa-doppa-doms, chai tea, Diwali, and elephants and cows in the streets. The authors’ note relates their own experiences on a tuk tuk, and a glossary explains some of the unfamiliar words from the song. 40 pages; ages 3-6. Pros: A familiar song is used as a vehicle (pardon the pun) for a fun introduction to the sights and sounds of India. The busy illustrations give kids plenty to look at, and everyone on and around the tuk tuk seems to be having a wonderful time. Cons: Tuk tuk seatbelt laws seem a bit lax. This looks fun! Need to get a copy for my neice/nephew who split time between US and India! Thanks for highlighting. I hadn’t seen this.